I love discovering small hole in the wall joints like La Cervicheria. This unassuming small shop serves up super fresh seafood. With only a couple tables inside, the restaurant fills up fast! The only downside to eating the refreshing seafood is they don't serve beer or any alcohol, but many patrons seemed to be BYOB. With so many tauntingly delicious sounding items, it was hard to choose what to eat! The portions are quite generous here and a cerviche can easily feed one person. The chapin cerviche had tons of fresh shrimp, fish, octopus, and scallop all marinating in a briny, limey, tomato based that's flavored with Worchestershire sauce, avocado, and cilantro. The concha negra (bloody clams) cerviche is one of the restaurant's more popular dishes. The murky black color doesn't exactly make the dish look appetizing, but digging in the diced up, crunchy clams mixed with onions, cilantro, octopus, and shrimp were absolutely delicious. Saltine crackers are given to scoop up the limey tart, but sweet seafood. Besides crackers, tostadas are given for another dipping and scooping alternative. The mariscadas was a seafood stew with shrimp, mussels, and calamari served with a scoop of rice. There are 3 flavor choices: caribena, veracruzana, or curry. 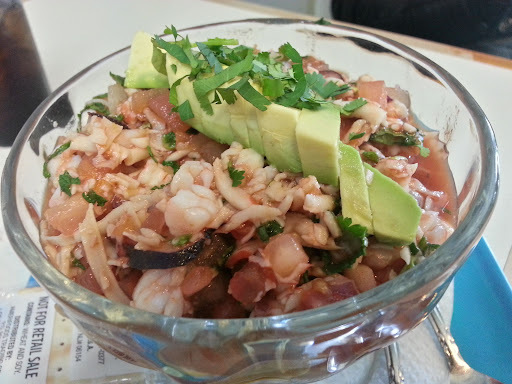 Although the cerviches were amazing, the winner here was the mariscada. The hard to describe complex broth was slightly spicy and utterly delicious. Loved how the rice was there to soak up the rest of the broth!